Drive your professional and personal development forward with The Dermatology Nurses’ Association’s (DNA) educational series – Dermatology Delivered. DNA’s Dermatology Delivered Education Series opens the door to new opportunities – from the written word to online education. 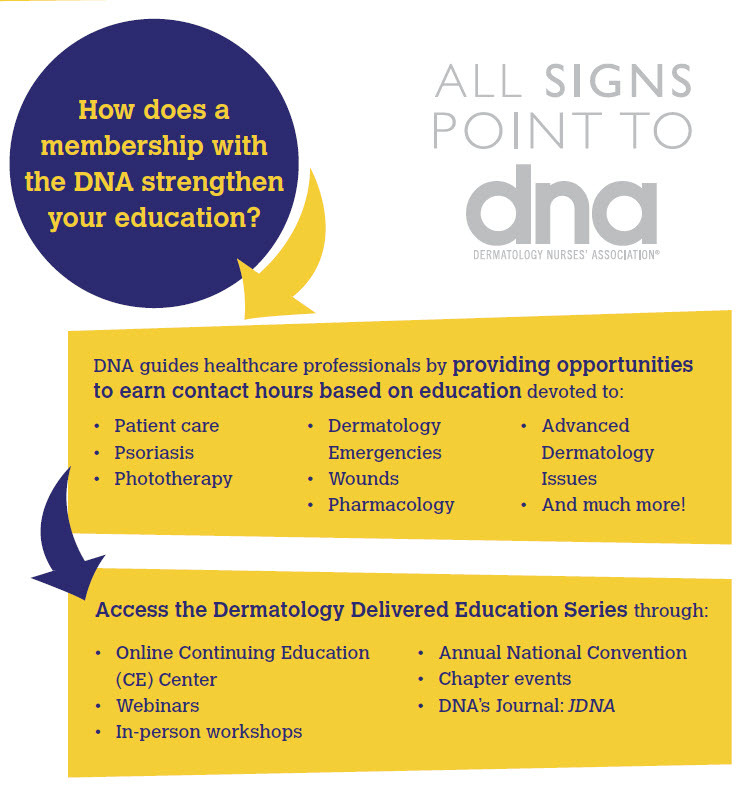 As a DNA member, you will have the chance to participate in live events at a national and local level, gain access to our renowned publication, the Journal of Dermatology Nurses’ Association (JDNA), and top notch online continuing education programs for NPs, RNs, LPNs, Medical Assistants and other healthcare professionals. DNA’s annual convention is a must-attend event for all dermatology nurses. In a special tribute to Joan Shelk, DNA Past President and the developer of our first workshops, a special phototherapy program has been developed. The Joan Shelk Fundamentals of Phototherapy Workshop is an intensive one-day training for those administering light therapy under a doctor’s supervision. This workshop covers psoriasis and other photo-responsive skin diseases.DNA is the place to meet and learn from others in different clinical settings (outpatient, private practice, academic, government, etc.) and specialties (cosmetic, oncology, dermatological surgery, general dermatology, etc. )…and this can be done right in your backyard through our local chapter events! JDNA, the official publication of the DNA, is the resource of choice for dermatology nurses and other healthcare professionals seeking critical dermatology information and resources for their patients. Engaging, peer-reviewed articles cover a broad scope of relevant dermatology topics, including clinical practice and management issues, research and case studies, patient education and collaboration with other disciplines. The Dermatology Nurses’ Association is your source for the latest news, education, and resources to support your dermatology team.